Gone are the days when travelers had to visit their local travel agents to book flights or search for a suitable hotel. To cater to the ever-growing market demand and attract a digitally adept customer, travel companies continue to improve their services and seek ways to make travel ever more convenient. Just look at how JetBlue, Marriott, and Ryanair transform travel experience digitally. According to Expedia, travelers visit 38 sites on average while planning a trip. The plethora of travel search journeys begins with googling and ends with online travel agencies and TripAdvisor. While this problem can be solved more conventionally by unifying user experience within a single platform, it has yielded a great opportunity. To avoid tiresome planning and simplify booking process, we can use chatbots – mobile user-friendly personal assistants with analytical and predictive capabilities. A chatbot is a program designed to simulate human conversation using artificial intelligence. After becoming one of the trendiest words of the past year, chatbots are predicted to disrupt the travel industry and set a new standard in the mobile booking arena. As the mobile-booking share is flourishing – it’s expected to become 70 percent of all digital booking by 2019 – users are drawn to chatbots, an available and personalized shopping tool. Besides, a good chatbot can help users reduce long hours of indecisive search. We’ve already covered the basic principles for designing chatbots, and now we want to focus on the use of the technology in travel tech. Among many potential uses of technological advancements in travel, chatbots occupy their own niche. Being the next tier in the evolution of personal travel assistants, bots can handle a broad range of tasks, depending on the domain they are used in. Just as in finance or healthcare, there’s only so much you can do with chatbots in travel. 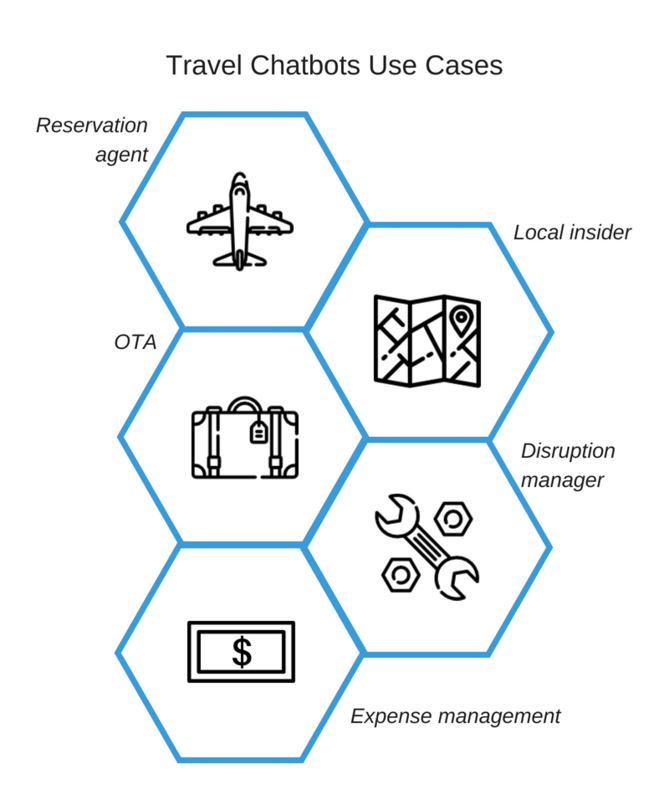 Let’s have a look at the categories to explore the basic use cases for travel chatbots. 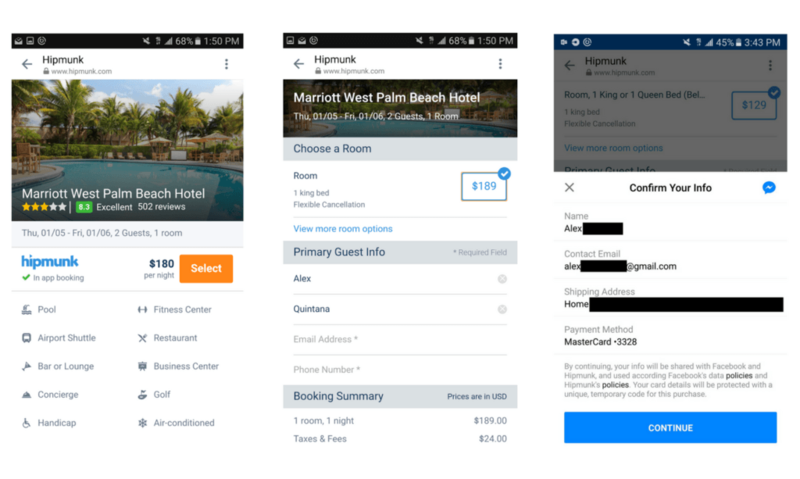 Booking.com, Skyscanner, and many other reservation services already allow travelers to seek flight and hotel recommendations, and book them via Facebook Messenger, Slack, or Skype. These chatbots offer better and more personalized customer experience when compared to websites and apps and are often similar to calling a human operator. Users are usually prompted to start with typing their starting point, destination, and desired dates, that will then allow a bot to search through hundreds of sites for the best deal. Moreover, travelers can expect additional functionality such as “Route tips” by Skyscanner showing the cheapest or the busiest weekday to travel, or the “Inspire me” option on Cheapflights. The popularity of travel chatbots as reservation agents is in rapid growth mode. For example, in February Skyscanner reported over a million unique chatbot interactions. According to SITA, 14 percent of airlines already use chatbots and Finnair has recently joined them. Their chatbot Finn, launched in August 2017, sells tickets, answers frequently asked questions, and informs about baggage allowance, time of flights, etc. Oscar, Air New Zealand`s chatbot helps book tickets, select seats, and add extra luggage to booking online. It is available on the airline website and in the mobile app and suggests requests in chat. At the beginning of its existence Oscar was able to answer just 7 percent of customer questions, but now it can respond to more than 73 percent of them. Expedia chatbot, launched in 2016, works on Facebook Messenger and allows users to find rooms in hotels worldwide. After a user enters the location and dates, the chatbot suggests suitable variants and then prompts a user to visit the Expedia website and complete the booking. Irish chatbot Dorothy facilitates booking rooms in one of 40+ hotels available on Allora. Dorothy is a cross-platform bot that operates on Facebook Messenger, WhatsApp, Viber, Telegram, etc. It also provides users with information about the hotels, so they don’t need to visit their websites, and it allows users to perform transactions online. However, some bots go beyond reservations, and can assist in saving money on booking. The DoNotPay chatbot searches for tickets and hotels in the US and tracks their prices. It sifts through the inbox and finds confirmations for the reservations. As soon as the price drops, the bot informs a customer about it via SMS. Then a customer can decide whether or not to rebook a room or a ticket. Besides that, it can get a discount for the traveler if the airline has lost luggage, the flight was delayed, or something went wrong during the flight. In the social-media dominated world, vendors find it hard to keep any disruption processes private and avoid negative word of mouth. Customer support via chatbots allows users to privately address their complaints that AI can automatically prioritize and categorize for easier handling. Now, instead of looking for a contact number or addressing their troubles to staff members not responsible for a failure, customers can use a bot to request support. Furthermore, travel businesses can track problems and react to them accordingly helping to diminish some of the stress their employees experience. Checkmate allows hotels to respond to feedback in time and avoid negative reviews. The platform opens a convenient channel for personalized and automated communication between visitors and staff that allows customers to leave a request via chat that is then transferred to a designated staff member. Thus, employees address failures in the moment, before a negative review goes up on TripAdvisor. Due to the natural-language-processing (NLP) capability, chatbots can understand or be trained to recognize vague queries such as “romantic beach getaway” or “Europe family vacation” to offer a complicated set of services, from transportation to places to stay and visit. A bot will catch the trigger words and use them in the search without making a customer go through a long survey with limited reply options. After helping find a perfect hotel and the best flight deal, a bot will locate a rental car service, provide a local weather forecast – even taking the customer’s budget and dietary requests into account. Travel chatbots can assist travelers both with booking and trip budgeting, keeping all documents and tickets in one place, sending updates and reminders. 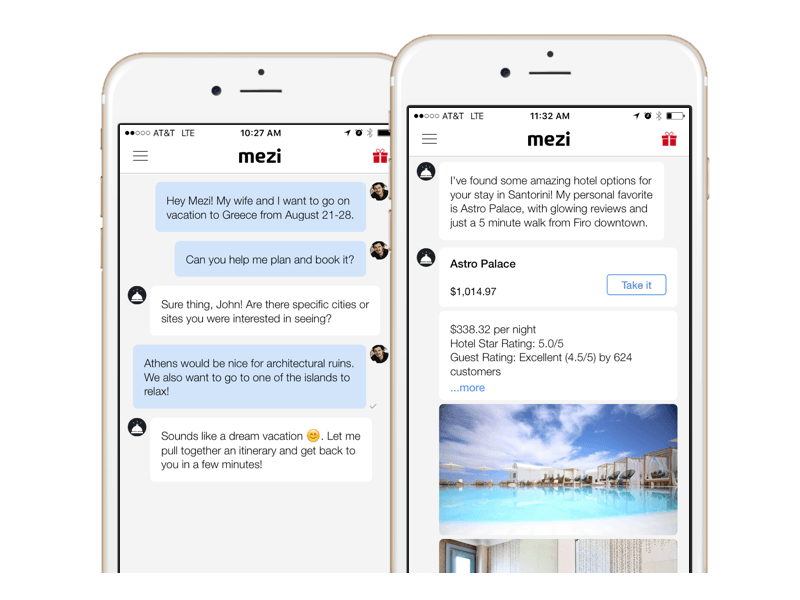 While travel assistant Mezi takes time to reply, the bot plumbs the depths in search of the most personalized options, whether it’s a hotel with a pool or a vegetarian meal on a plane. Kayak will also update you on your flight status and dispense travel advice. Chatbots also reshape boat travel. A chatbot created by Texas startup CruiseBe assists cruise fans. This chatbot helps plan the entire cruise, offering information about ships, ports, activities, and hotels. It can even book a hotel, but the option to book a cruise via the chatbot is not available yet. Sam, a chatbot launched by FCM Travel Solutions, is a new 24/7 personalized travel assistant that supports a user at every stage of the trip. Mostly business-travel oriented, it is both a booking tool and a travel agent that provides live information about changes during the trip and recommends some local places to visit. It also calculates travel expenses and provides a user with a city guide. Plus, it offers booking options in compliance with the travel policy of a user`s company and collects receipts. Willing to dive deeper into the topic? Visit our Techtalks to find the answers you are looking for. Talking about receipts, it’s difficult to collect all of them and keep them in one place, but there are chatbots for that. SAP Concur offers a beta version of a chatbot on Slack that can book flight tickets and create a summary of expenses. A similar bot integrated with Slack is Teampay. Its functions are similar to Concur`s, but even more nuanced, because it allows tracking not only travel expenses, but a number of corporate spendings and purchases. Claire, the chatbot by 30SecondsToFly assists with all stages of corporate travel management. Starting with planning and booking according to a company’s travel policy, it provides the analytics and enables team to drag all the receipts right into the company’s expense management system. Claire is available on several platforms including SMS, Facebook, Slack, and web. With the mounting popularity of Airbnb and hostels, many travelers are looking for ways to experience foreign places like locals do: to live, eat, and relax like a native. A bot for Uber, Marsbot from Foursquare, and Assist allow travelers to experience cities through local reviews and recommendations. Depending on the desired activity, be it brunch or a game of laser tag, these chatbots take their content from nearby locations and provide options as if a traveler was a resident. So, customers don’t have to search for the most recommended places on social media or browse the local discussion boards. Such bots can become a part of the hotel service and they have already appeared in Japan and Germany. Bebot is a Japanese chatbot that serves as a personal guide for customers of several Japanese hotels. It provides information about sights, local food, and helps navigate around the country. The same features are offered by Gooster, a Messenger chatbot that provides a number of branded services for the guests of six German hotels. Travel chatbots can be used in the transfer process too. Frankfurt Airport and Lyon Airport have their own Facebook-based chatbots that provide travelers with airport guides, information about places available in the airport, service facilities, and send updates on flight status. Now, how can both travel service providers and their customers benefit from chatbots? Aside from opening a personal and smart communication channel between you and your customers and adopting one of the most impactful technologies of the near future, there are plenty of reasons to use chatbots for your travel business right now. Here they are. Many queries that travel service providers handle on a regular basis can be addressed by a chatbot. By delegating the easily automated tasks to a bot, you can leave employees to manage complicated queries where human interaction is necessary. According to Juniper Research, chatbots will help eCommerce companies save $8 million by 2022 by saving $0.70 per every user interaction. Additionally, a good bot can unclog call centers and automatically handle things like routine booking changes. 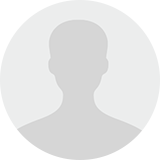 Pypestream leverages the power of NLP to help companies resolve repetitive queries and transfer complex issues to human agents. Such messaging platforms as Messenger and Telegram allow users to make payments directly in a chat, without transferring them to a website and repeating the payment information each time. The credit card info that’s already stored in the app’s system can be used to make purchases via a bot. Thus, bots provide a simplified experience and can basically replace traditional websites and apps for the users who rarely utilize them. Chatbots make it uncomplicated to return to the previously discussed data because the conversation history stays available to customers. A user will always be able to return to the previous suggestions and have all important information saved in a single conversation flow. Human staff is not always available to provide timely customer service during holidays and other peak travel times. A chatbot is available 24/7 and can provide people with necessary information anytime. Today, advancements in artificial intelligence allow bots to identify and solve simple yet urgent problems without human involvement. Customers won’t feel abandoned regardless of the time zone they’re in, and travel companies can save on call center operators. Chatbots provide quick and efficient communication that is so characteristic of the mobile experience. The survey by Opera Mediaworks revealed this unsurprising data: Eighty-five percent of travelers book travel activities via mobile. Aside from that, most people already rely on smartphones during trips to navigate, search for restaurants, and make digital payments. How many apps do you have on your smartphone? Chances are, you, just like most people, only keep the apps directly related to your everyday life. Since most people travel 1-5 times a year, your branded app will probably be in the 26 percent of apps abandoned or deleted after the first use. Facebook Messenger, on the other hand, the world’s number one messaging app, will most likely be actively used for a long time along with the chatbots it carries. Not all chatbots, just like not all apps, succeed. Instead of rushing to create a bot just for the sake of it, use our recommendations to ensure that your chatbot will be both enjoyable for your customers and profitable for you. When using mCommerce platforms – which is what travel companies often are – users must be sure that their payment details or passport information will stay safe. In the case of third-party platforms such as Facebook Messenger, requests are automatically verified using authenticated tokens that allow an app to send a user’s information to a parent platform. Regardless of the chosen platform, security is in your hands as well. Aside from a simple user authentication, there are other ways to secure a customer’s info, such as timeouts, Touch ID or retina scans, end-to-end conversation encryption, and self-destruction of sensitive messages. As a travel tech consultant, we always recommend our clients to start with safety measures first. Chatbots are not meant to completely replace your website and therefore don’t have to satisfy each aspect of customer experience. Which is why you need a chatbot with skills sufficient to respond to the challenges your customers will most likely experience. “At first, your purpose should be connected to your target market. You should start small and focus on giving unique functionality to your bot. Personalize your bot differently from other bots available in market place,” says Pax Bhati, Senior Manager at EY. Start with one customer segment and analyze what questions or requests you receive from them most often. That will help you define what kind of a chatbot would serve this segment best. Currently, a common practice for chatbots is to communicate with customers using only AI and in case a bot struggles to find a solution, transfer them to a human operator. But remember that the ultimate goal for designing a chatbot is to delegate the tasks that can be automated, not to make it reply to custom requests. Additionally, make sure that your customers understand they’re talking to a bot. If you lead a customer to believe that a bot is a human assistant, it will end in user confusion and disappointment. A chatbot should know when to hand the task off to a human. For instance, a text-based chatbot Ella launched by Sabre assists travelers informing them about flight changes, reservations, etc. and answering questions. In case Ella can’t answer the question, it directs a customer to a live agent. People often turn to chatbots when they don’t have the time or patience to browse unwieldy mobile websites. So, make sure that a user won’t need to google each significant detail that a bot can provide itself. For instance, if you suggest several hotel options, include each hotel’s rating and mention whether there’s a cancellation fee. Don’t abandon your users after you’ve helped them. Concentrate on the point of beginning and ending of the conversation with a customer. Message them after the flight or hotel check-in, ask them to rate their satisfaction with the chosen service, or offer suggestions about local restaurants and events. Make sure your messages are unobtrusive and caring. Competent chatbots encourage customers to come back and fall into a loyalty loop, converting one-time users to lifelong clients. To provide a multilingual experience and greatly expand your audience, consider creating a chatbot that people can use regardless of their native language. There are two ways to do it. The easier one would be building a bot that doesn’t include NLP and uses predefined questions and answers. Booking.com, for instance, uses templates with pre-translated questions and replies that allow hotels to chat with customers in 42 languages. Another method is to design your bot to fit different patterns and train a natural language processing model for the new language. Take note, that even though the second way requires more time and effort, the possibilities of using NLP for understanding and learning from a user’s intentions meets the expectations of users to converse with bots the natural way as if they were talking to a real person. You need to justify the necessity to create a chatbot instead of a website or an app. Use unique capabilities of chatbots to augment your current services or provide an exclusive look at something customers already use. For example, Waylo‘s Messenger bot allows travelers to track hotel prices in the entire city or the desired area and book hotels at a price predicted to be the lowest at the time of visit. Your chatbot is a part of your brand, sometimes the first part to represent your brand to the customer. So, humanize it, give it a suitable name and an image. To build a successful chatbot persona, consider one of twelve brand archetypes. Think of the way it will interact with your customer: which emoji it will use, in what manner it will converse, and how it will influence your brand. What’s your take on the topic? Chatbots and AI adoption are not only changing how customers are connecting to retailers but also transforming the way the world is going to communicate in the immediate future. According to a study by Twilio, nine out of ten users would like to connect to brands via messages. Faced with major digital disruption and the growing need to adjust to the customer’s digital needs, travel companies have to provide excellent customer experience, and chatbots can be a big part of that. Along with providing instant response throughout a traveler’s journey, bots are becoming even more personal than human operators – almost as one of the trusted friends in your contact list. And even considering that the technology in its current state is still new, its adopters are investing in a future where human/AI conversations are not just efficient but expected. We’re excited to see it happen. How about you? Tell us what you think about the role of chatbots (and conversational interfaces in general) in the travel industry. And if you want to know how else to apply AI in Travel Tech, check out our story about data science use cases in travel. That’s some unique information on the web!! I completely agree with all your point for chatbots in travel expense management. In such, they should have some time and relaxation time too. Planning is must to handle this. Great info and worthy of shares. Thanks and keep writing.